Click on the “play” button in the centre of the image above to see a preview of the educational children’s book Toodle Toodely Doo which has the included song-story (the full length is over four and a half minutes long)! This engaging song-story is about various animals who visit a family and say “hello” in different languages: Bonjour, Ohayo, Ni hao, and G’Day. There’s Kia Ora for the Australian/New Zealand versions and Hola for the international versions of this song and video. This is great educational value and creates learning through a fun activity. It’s also an action song with a catchy melody and easy-to-copy movements for children! The 24 page book has beautiful illustrations and lots of detail. The book and song (CD/song download) set is available as an individual purchase ($24.90) and other products accompany the book and song for that extra fun and developmental experience for little songsters. 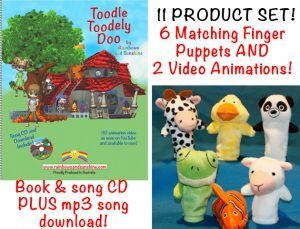 These products are: 2 matching 3D animations available at $3.90 each – original and singalong versions; and there’s also a set of 6 cute animal finger puppets which match the characters from the story (the set is $19.90). These products form the complete 11 Product set for Toodle Toodely Doo – it contains all the Toodle products and is packaged together at $49.90. Included are suggestions for how to use these products to encourage learning and cognition – you’ll find these on our Tips and Ideas menu. Toodle Toodley Doo is engaging and fun – stimulating children’s imagination and creativity, sensory awareness, cognition, language and communication; enhancing auditory, visual and tactile senses; encouraging fine and gross motor skills and co-ordination through participation in the actions; building listening skills; moving learning and development forward… so many benefits of the matching books, songs, videos and toys. See details of this complete set here. Click the “play” button in the centre of the image below to see a preview of the amazing animated video which matches the book and song. Everything is available separately and bundled packs with the complete set of book, song, video and finger puppets are also available. These are great value and are a unique combination for fun and learning experiences! This is the second complete set released; “Black and White Cow” was our first complete set (book, CD, mp3 song, 2 animated videos and large soft plush toy cow). The main character in this song story, which plays for almost 4 minutes, is an adorable cow who also appears in Toodle Toodely Doo. Both the Toodle books and Black and White Cow books with songs are those donated to children-in-need – your purchase helps our donation program to continue! See our menu items “About” and “Community Program” for more details.